Monkey 2015 Horoscope in the Year of the Green Wood Sheep predicts that there will be plenty of restlessness in your lives. Many ventures will be successful if this changing energy can be channelized to complete them. Concentration is required both in personal and professional if you wish to be successful. Monkeys should put the interests of other people first rather than being self-centered during the year 2015. Year of Goat will see the Chinese Monkeys trying to avoid unnecessary struggles. They can keep their mental balance by turning towards religion and spirituality. 2015 Chinese horoscope predictions for Monkey promise that you will be thrown into the contact of highly influential people. You will become famous in these social circles. You will need to suppress your feelings of envy. Only then will you be able to enjoy the company of your friends and family. Monkey 2015 Horoscope predicts that you will not face any problems in your professional life because of your brainpower and capacity to solve tricky situations. The Chinese Monkey zodiac sign can adapt themselves to any situation in their jobs or businesses and are good at jobs requiring team work and organization. Year of the Sheep 2015 predictions for the Monkeys indicate a troublesome period for finances during the first few months of the year. It is advisable not to indulge in risky ventures during this year. Monkeys get into relationships easily but are not committed to the association. They are seekers of pleasure and are selfish in their relationships. Monkey 2015 Horoscope warns that if you continue doing this, then you can forget about having a stable relationship in the future. 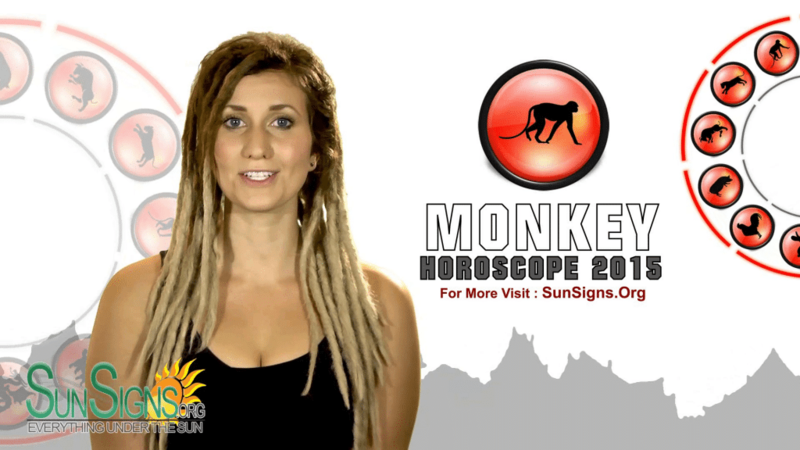 Monkey 2015 Horoscope forecasts that there will be many minor differences with your spouse. Do not enter into a blame game and try to analyze the root cause of problems. The birth of a child will bring harmony in the life of couples and all problems will be forgotten. Holiday trips with loved ones to a serene place will be beneficial. 2015 presents many opportunities for both business travel and family trips for the Chinese Monkeys. They will be profitable for both expansion of business as well as for domestic happiness. Monkeys are subject to swinging moods and may lapse into depression during the Sheep Year 2015. Monkey 2015 Horoscope predicts that their craving for growth will induce mental and physical tension. Study of spiritual books and relaxation methods such as yoga will get rid of their stress and improve their mental health. Monkeys will need to take care of their health in 2015. You will have a financial windfall.